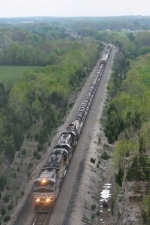 Description: Loaded coal train headed north across North Commercial Street in Manchester. Description: This is where I grew up & got into Railfanning. Grandpap & I use to sit here at Van Dorn Road in Alexandria, Va and watch Trains Galore on the Southern/NS. Description: NS autorack train 18N eases eastward along the Lehigh Line approaching 13th St. in Manville behind power including former Burlington Northern SD40 on a sunny morning. Description: BNSF 4824 leads 191 while idling at Cytex mills in Langley. Description: A BNSF westbound holds at Basta (west Fullerton, California) for the afternoon onslaught of Amtrak and Metrolink passenger trains before continuing on to its final destination of Hobart Yard in Los Angeles. The power on the headend consists of BNSF Dash 9-44CW 753, TFM SD70MAC 1611, NS Dash 9-40CW 9153, NS SD70 2520, BNSF Dash 9-44CW 1023 and BNSF Dash 9-44CW 4507 - six engines and five paint schemes! Description: BNSF 4507 is the sixth unit. 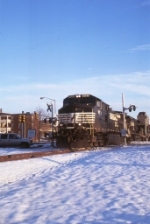 Description: 21M counts off its last mile in the State of New Jersey behind all GE power. Description: EB doublestack/intermodal, Main Street, 0736 hours. Description: NS 111 EB, usually like this one, with a lot of power. 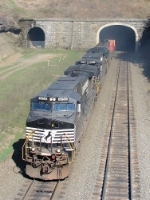 Description: 21G pops out of the tunnel under a cloud of exhaust. Description: Eastbound on track two with an ex-Con in the middle. Title: NS 9153 taken at 5 19 am, later on that day GM would go on strike at 10 am.